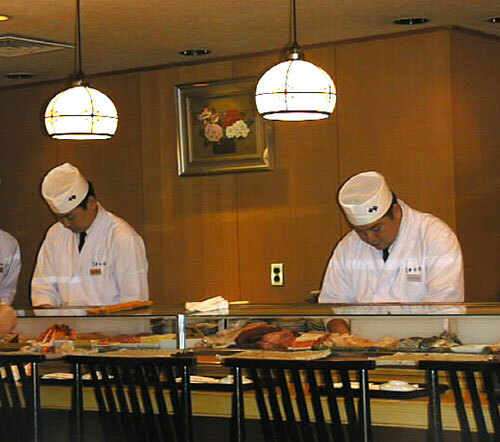 Two itamae (chefs) prepping before the store opens, circa 2001. I've never ran a restaurant myself, so most of my knowledge on this matter is second hand. My mother ran a very successful restaurant in midtown Manhattan called Tsukiji Sushisay. In addition my stepfather was the accountant for several Japanese restaurants in NYC. I did however work the front desk for a few months, and helped out over the years with things like translating legal documents, making brochures, or creating their website. I translated the menu to English, and even taught basic 'sushi-counter customer-service English' to many of the chefs. "I'm sorry, we don't have spicy tuna." is one phrase I remember teaching them. I think running any successful restaurant in a highly competitive place like New York City is extremely tough. It can be exhilarating, and a lot of fun, but it is very, very stressful. When my mother retired at age 60, she was totally worn out. She suffered from high blood pressure and migranes constantly for the last couple of years. Still, she says it was the most fun period of her life. And, the restaurant was hugely successful. It only seated 92, but it did 2 to 3 seatings at lunch and 3 to 4 at dinner, on a regular basis. On truly crazy nights it could even do 5. So here are some things that a sushi restaurant goes though. Some are general restaurant things, others are specific to running a sushi restaurant. There were 3 types of staff in a sushi restaurant: kitchen staff and busboys; chefs (the itamae); and waitstaff + front of house. As with most NY restaurants, kitchen staff was mostly Hispanic (in this restaurant's case mostly Dominican). That part was actually the easiest since the work itself did not need a whole lot of training, and if someone dropped out the 'boss' of the kitchen staff could always arrange for someone else to come the next day. Plus they all had valid work visas - no one with a non-valid visa was even considered. Waitstaff/front of house was somewhere in between - they weren't hired unless they had valid visas, but if someone quit there was no 'waitstaff network' like with the kitchen guys. Just about all Japanese restaurants run continuous classifieds in local Japanese papers for this reason. Fortunately, the restaurant had a great head waiter who was there for almost the whole time the restaurant was in operation, plus a couple of stalwart veterans. About 2/3rds of the waitstaff at any given time were Japanese or could speak Japanese. The front desk could all speak Japanese (and English too of course) - since more than 1/2 the customers were Japanese that was pretty important. The most difficult part was the chefs. As I explained here: Sushi: What is it like to train to be a master sushi chef? it takes many years to become a sushi chef that can be entrusted with a really, really busy station. So that meant the itamae had to come from Japan in most cases, since they had to have the skills to just jump in and start working. That meant constant visa issues - the restaurant had an immigration lawyer on retainer (besides a regular law firm for other stuff). The INS did not really consider 'chef' to be a unique trained job, so it was always a tossup whether someone would get approved for a work visa or not. In some cases, if the application was made for a 'manager' or 'sales person' it would go through easier. IMHO this is just a bias for white collar jobs...I mean, a sales guy doesn't need 3 to 10 years of intensive training. But I digress. There were a few cases of local hires (who were hired as kitchen staff) getting trained to become chefs, but most of them dropped out because it was too tough. A couple did get halfway trained...and then went to work somewhere else. One guy did stick to it though, and he's still working for the company at another restaurant in Japan. One Chinese guy was very promising...but it turned out he was lying about his visa status and had faked papers, so he disappeared when that was discovered. This was fairly easy. There are several wholesalers in NY that kind of control the Japanese food and seafood supplies. As long as you paid your bills regularly, they loved you. Since the restaurant was very successful and properly run (you'd be surprised at how many restaurants are in the red because the owners/management skim off profits, or don't know basic bookkeeping, or get ripped off by unscrupulous employees etc...) that was never an issue. Sometimes, some seller off the street so to speak would come with something they wanted the restaurant to try. One time for instance someone came with a big box of matsutake mushrooms grown in Portland, OR. But most supplies came from the big wholesalers like JFC, Yama Seafood, etc. Periodically a whole tuna would come in, and all the chefs would help with breaking it down. That was quite a sight. I wish I'd taken pictures. One of the biggest headaches in the day to day running was the smooth functioning of equipment, especially the air conditioning or heating (partly due to the problems caused by the building renovations). If the air conditioning failed in midsummer in NY...well you can imagine the complaints from the customers. Air conditioning maintenance was a monthly thing. And garbage pickup..that was an interesting thing too. I don't know about now, but at the time a food business had to pay a private contractor for garbage pickup. And, well the head of the company my mother hired (a lovely but slightly scarred man) was like, connected to certain families. But anyway...just another interesting aspect. One time, my mom was visiting me for a week in December after I moved to Switzerland. She got a call in the middle of the night our time - the sprinkler system had broken due to one of those New York cold snaps (it was related to the construction work....see below) and the restaurant had gotten flooded. The chairs, the carpet, etc were all ruined. She had to fly home ASAP. The restaurant was back in business in less than a week though. The building was sold to new owners a few years into the lease, and they didn't want a canopy outside the restaurant entrance...so there was a big brouhaha over that. They also wanted to close up the entrance to the restaurant from the lobby. The biggest issue was when they started major renovations of the building, all around the restaurant. The dust and noise were a huge headache for several years. The moral of this story is: when leasing a restaurant space, have a very good lawyer look it over carefully, to deal with all contingencies. A restaurant can't survive of course unless there are customers. The restaurant had a lot of loyal regulars. Restaurants love regulars, and treat them with care. One timers don't get treated badly, but if there's a choice between Customer A who has been coming to the restaurant for years every week vs. Customer B who's there for the first time....guess who gets priority. There are three things that you can do as a customer to really annoy a fine-dining restaurant, besides the obvious things like be rude to the waitstaff or not leave a tip. Be late or forget to cancel your reservation. This is by far the biggest annoyance. You do that repeatedly, you are likely to be blacklisted by a popular restaurant. We actually did that to one very prominent and wealthy person. He threatened to badmouth the restaurant to all his important friends, and my mother was like 'go ahead, make my day'. (She is a typical small Japanese lady by the way, all 152 cm of her.) After a few weeks he called her up to apologize and ask to be let back in. Ask to be re-seated just because you see empty tables/seats - and be offended if you are refused. If the restaurant is successful, it's likely that those tables are booked up and in 15 minutes they'll be filled. Taking reservations is an exercise in logistics - you have to figure out who can be seated where, and how long they will take, and so forth. You're doing this while looking at the seating chart all the time. So when customers ask to be reseated it can really mess things up - especially when a party of 2 asks to go to a 4-seat table. Profit, profit, profit - or not. My mom's restaurant was part of a chain really - the parent company still operates about 30 sushi restaurants in Japan (but no more overseas...the owner got freaked out by 9/11, since he was in NY that day, and decided to not operate overseas anymore.) So the restaurant's finances were all aboveboard and everything. This was not the case for some of my stepfather's clients. In one case, a pretty successful Japanese restaurant's profits were basically all going up the owner's nose, and for the upkeep of his girlfriend (he had a wife and kids, naturally). Or another of his clients almost went out of business because the owner/chef despised invoices so much, he'd like make little bundles out of them and put them in a box. (My stepfather called them "invoice-nigiri" because they were like little rice balls. ^_^) Luckily for that guy my stepfather saved him in time and he later sold his restaurant and retired happily. To get along well in the NY restaurant scene you do need to do some schmoozing with other restauranteurs and chefs and critics and the like. I think this is where my mother had a leg up on other Japanese restaurants - she spoke pretty good English, and had (still has) this wonderful bubbly personality that just draws people to her. So she was able to do the schmooze with various famous chefs and restauranteurs that are still very prominent in the NY restaurant scene. If you asked them they may still remember her. I know at least one of them asked her to come work for him. The schmooze is important for making customers feel happy too. The restaurant had a very happy atmosphere. My mother, when she was on her game (and not grumpy due to migranes and fatigue) was really a sparkling hostess. The head waiter guy was always good, as were the veteran waitresses. The chefs, although their English levels varied a lot, were trained to always be polite and pleasant (although some managed it better than others). I think it made the customers just feel good to be in such a place. Celebrities showed up all the time of course -- this is pretty normal for a popular NY restaurant. That was fun, but not as big a deal as you might expect. There are some pretty crazy stories involving very rich people or celebrities....but I don't know if it's good taste to talk about those so I'll leave it at that. Anyway, celebrities do add to the decor, if you know what I mean. A restaurant opened on the other side of the road from my mom's restaurant. They had a much nicer space - bigger, and it was on the corner (my mom's restaurant was in between avenues). It was a caviar and seafood restaurant or something. The decor inside looked beautiful. But, it was almost always empty. The guy who ran the place (the manager or owner, I was not sure which) used to wander over to my mom's restaurant when they were in full swing at lunchtime and the customer line was spilling out to the street, and gaze into the window mournfully. Once day he finally came in to ask her how they were so successful while his place was empty. I don't remember what she said...but it's a whole lot of things as I've tried to describe, plus a bit of luck and magic. I found an old Chowhound thread about the closing of the restaurant, which is full of erroneous 'information' about the reasons for the closing. I'm also aware that the restaurant that took over the premises lied to people about it being the 'same management' (including to Michelin inspectors). Eh. The great head waiter that I described in the text was called Tanabe-san. He was an avid marathon runner, and ran the New York Marathon every year. Despite being a health fanatic, he died of cancer a couple of years after the restaurant closed, at the ege of 48. Finally, about the two itamae (chefs) pictured in the photo above: The one on the left, Mera-san, is still working for the same company at their Kyoto restaurant; the head chef there is another former New York store alumnus called Ito-san (no relation). And the one on the right, Koyama-san, took over his family's sushi restaurant in Ibaragi prefecture after his father, also an itamae, retired. Unfortunately Koyama-san's restaurant and town were damaged by the March 11, 2011 Great Eastern Japan Earthquake. The interior of the store was almost totally destroyed, although the building remained standing. The bigger damage they suffered though was the inability to use any local fish due to the radiation leakage from the Fukushima Dai-ichi power plant. He was always able to deal with things with humor, and it was no different after the earthquake. He said he hastily grabbed the two most expensive bottles of sake on his shelves. He breathed a big sigh of relief - then all the the shelves, and everything on them - sake, dinnerware, everything - came crashing down around him. The way he told it was so funny, even though he'd just lost so much. He's still in business despite everything, and keeps plugging along. Submitted by maki on 2013-12-31 07:23. Not gonna lie - I'm dying of curiosity about which restaurant it is XD But I wouldn't ask for personal information you didn't want to give for the world. That was a fascinating insight into both sushi restaurants and the food industry in general though. I feel tired just reading about what your mum had to do! Crikey, she's one tough lady. Fascinating article. I love your stuff. Sorry to hear about the ongoing health problems. Thinking of you. I learn so much from all your posts. Thank you. Wishing you good health, happiness and prosperity in the year ahead. Thank you so much for sharing this story -- it was absolutely fascinating! I've always thought that restauranteurs were a special breed of brave, hard-working people and this only confirms that. Thank you for sharing, as always. Your posts are always so interesting and in this one, also so close to the heart. Loved reading it and as this year comes to a close, I wish you a quiet, nice New Year's and wishing you much goodness and better health in 2014. I'm so glad you posted this delightful and fascinating story from behind the doors of the restaurant. Vignettes of your mother taking on the challenges and dealing with the realities bring back fond family memories for me too and some personal laughs and winces. I hope the New Year brings you happiness, good health and quality of life. I hope you and yours get to have some of the best sakura wagashi when the blossoms symbolizing hope and renewal arrive to fill your life with the same. Here's to a Happy 2014. Wishing you well with your ongoing treatment. I understand the life of one day at a time, moans and all. An interesting and thought-provoking article. There are so many facets to running a restaurant and failing (or just doing poorly) in one area can have a profound impact. Kudos to your mother. Best wishes for you and yours in the new year. Oh this was fascinating. I rarely go to sushi restaurants because I am a vegetarian and it seems insulting to the chefs who are so highly trained not to eat what they so expertly prepare. Thank you for taking the time (and energy) to write this article. I hope 2014 is a much better year for you than 2013. May it be "the year of living well!" and very best wishes for a healthier 2014. What a fascinating look into a sushi restaurant. I was living in NYC at the time your mother's restaurant was open and I wish I had had the chance to dine there. I bet it would have been a great experience. Thanks for sharing this! Very interesting story, thanks for sharing it. My family owned a chain of restaurants that went out of business in the early 1990s. They were coffeeshop/pancake house style restaurants that became unpopular as national chains expanded and "healthier" food became more accessible. It's a fascinating, yet tough business and seeing it as a kid made me never want to do it myself. Good luck with your health issues, hoping 2014 is a great year for you! That was very insightful, thanks for sharing. Hoping the best for your health, I'm pretty sure your are going to overcome this. Whenever someone says, "You should run a restaurant..."
I love watching and reading about restaurants in full swing. I also love to cook, but whenever someone says, "You should run a restaurant," I point to articles like this one and say, "92 seats...5 seatings for dinner...that's 460 covers in a few hours!" It's certainly not the same as cooking for a family of four a couple of times a day. I would think a sushi restaurant would be particularly hard (which is why the itamae would need years of training) because customers at the counter must be ordering items a la carte one after another, AND they are in full view of all the customers all the time. I would rather be an appreciative customer. Thank you for sharing this! I loved reading this post. I hope your health gets better this year. I love all your posts, Maki, but this one was particularly fascinating! Thank you for the inside scoop - your mum sounds like a wonderful lady. 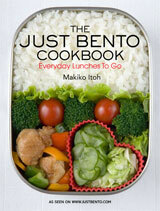 :) I love your blog (and your cookbook, which is one of my favourites). Blessings to you in 2014 and a happy new year! I love this story. I was in Japan last week and you're right, some sake are quite expensive. I know what you mean by having a bit of 'magic', although I think it's the vibe that everyone who works there give out. If you love what you do, no matter how stressful it may be at times, you will attract abundance, where ever you are. All the best for you and your treatment in 2014.